As with all true white teas, Bai Mu Dan is made with the leaves from the Da Bai Cha cultivar of tea bush. A leafier grade of organic white tea, Bai Mu Dan is made with slightly more mature buds and tea leaves than Silver Needle. This tea was first made in 1922 in Jian Yang in Fujian. This area is at a higher altitude than the neighboring Fuding, and the buds are thinner and more dense than Fuding’s Bai Hao Yin Zhen (Silver Needle). The ideal picking configuration aims at the leaf only being as long as the bud. This provides for a very robust and sweet Bai Mu Dan. Bai Mu Dan or “White Peony” is named for the shape of its leaves. Its one bud and two leave plucking standard is left in its natural shape without the kneading and shaping usually involved in making a green tea. 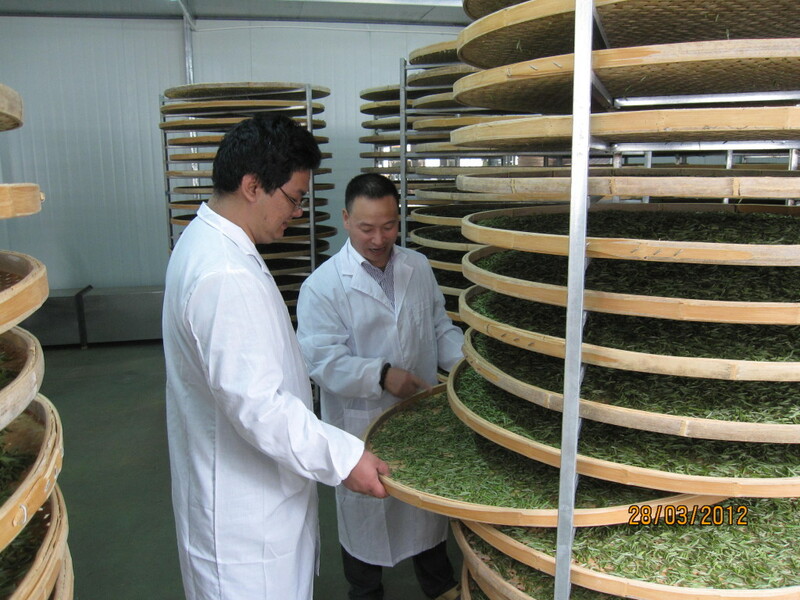 As other white teas, Bai Mu Dan undergoes a slow drying process which can take as long as thirty hours to complete. Unlike Silver Needle, the raw leaves of Bai Mu Dan are heaped into a short pile for this drying process. The withered leaves are roasted dry at a low temperature, sometimes with charcoal though more often with electrical heating elements. Once Bai Mu Dan is made, it is divided into six grades of quality. Our Bai Mu Dan is 1st grade, where great care has been taken to maintain the one bud and two-leaf standard. Lesser grades are made of more mature leaves and fewer buds. Good Bai Mu Dan yields many apricot colored infusions with a rich flavor that is noticeably fruitier than Silver Needle.